Since prayer was eliminated from public schools the quality of education has shown as steady statistical decline. Is there a link between the two? Humanism assumes that the supernatural does not exist and that reality must be discovered purely from man’s reasoning. Our public school system has been operating on this foundation since prayer was removed in 1962. Returning prayer to school would be an affront to this philosophy because prayer acknowledges the existence of something greater than the time, space, and energy universe in which we live. Allowing prayer in school sets an important standard. It tells students that they are more than just a collection of chemicals and energy that happen to be occupying space and time. Prayer is a action which proclaims that life is more than saving the environment or accumulating wealth. 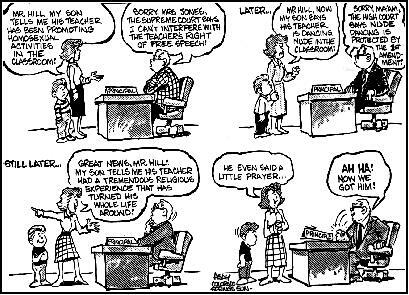 The fervency with which school prayer is opposed is not because the ACLU is trying to protect atheists from indoctrinated by religion. It is opposed because it represents the antithesis to the beliefs of those who set policy for much of our public school system. Prayer is a frontal attack on the notion that mankind is in autonomous control of his own destiny. It is an insult to those who believe that wealth, friends, or power can bring meaning or joy. A primary purpose of public education is to shape good citizens. This involves more than just the memorization of facts. The majority of Americans have always supported prayer in public school classrooms because they realize that there is something to be gained from the open acknowledgment of God’s existence. Morals can only be built on a base of the acknowledged existence of a moral source - God. Once acknowledgment of God’s existence is removed, there is no absolute basis for morals and a free society drifts toward anarchy. Since prayer was removed from public school classrooms in 1962, we have had a six fold increase in violent crime, our divorce rate has tripled, births to single mothers has increased five fold, the teenage suicide rate has tripled, and SAT scores have dropped 80 points.1 The removal of prayer from schools did not directly cause these social ills but they are a symptom of the spiritual decline which is at the root of these negative trends. Our nation was founded on the freedom to publicly acknowledge God’s existence. Allowing prayer to be part of school will improve, not detract from a student’s understanding of the universe. Our experiment with replacing the open acknowledgment of God’s existence with atheistic humanism has been a dismal failure. Those children who can’t tolerate the acknowledgment of a higher authority (which is what prayer demonstrates) could be excused, or better yet, taught to respect the beliefs of others. Whenever the opportunity arises to support the public acknowledgment of God by prayer (or any other means), it behooves all of society to take a vocal stand. As Edmund Burke, correctly noted in 1795, “The only thing necessary for the triumph of evil is for good men to do nothing.” As with all truths, this is still applicable today. 1. Bill Bennett, The Index of Leading Cultural Indicators, published by the Heritage Foundation, 1993. 2. 1970 Supreme Court Case, State Board of Education vs. Board of Education of Netcong.